Today, I had the honor of experiencing first hand the great work and services offered at the Veterans Transition Resource Center (VTRC), a nonprofit collaborative partnership between Life After Active Duty and Veterans Care Foundation, created to help fill the gap in Veteran Services in Las Vegas. Our Mission ~ To be a beacon, for our Military, Veterans and their families around the world, to help navigate the challenging obstacles from military life back to civilian life. At the invitation of a friend, I accepted an opportunity to hear insights from friendship expert, Shasta Nelson, author, speaker, and founder of Girlfriendcircles.com. Shasta shared years of research on the subject of friendships and the impacts on our health, stating ” We are experiencing an epidemic of unacknowledged loneliness. More than anything, people desire to feel loved and supported. Research shows that disconnection is the health equivalent of smoking 15 cigarettes a day, even likened to the devastating effects suffered by those with addictions like alcohol.” Point: loneliness, disconnection, and lack of a support network takes a toll on your mental and physical well-being. This subject effects each and every one of us, not just veterans. Everyone needs friendships and support networks. What I appreciated most from her interactive talk with the group today, many of whom lost loved ones in active duty or are current care takers for loved ones, is that before we can learn how to be supported we must first understand what it means to be a friend. Guys, this goes for you as well. Any relationship where two people feel satisfied, safe, and both people feel seen. 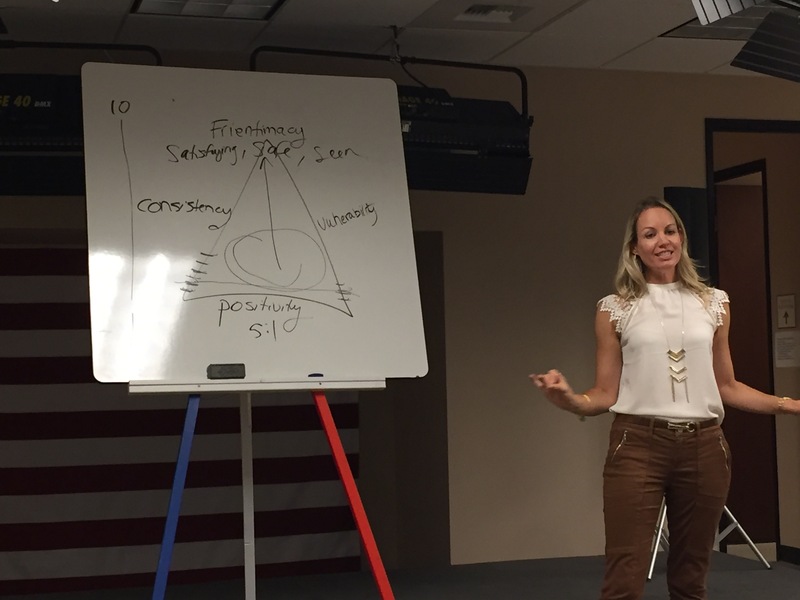 Shasta then drew a triangle on the white board in front of the group and shared the three most important components, requirements rather, for solid friendships to occur. According to Shasta and her research, we should have a ratio of 5:1 for positive to negative interactions. To be a good friend means sharing positively, impacting relationships in a healthy way. This doesn’t mean we can’t share hurts and hangups in our lives with our friends, rather, it’s an opportunity for us to share where we are at to be truthful with our current situation and then offer something like, “I’m going through a rough time right now with work/ spouse/ (fill in the blank), but I’m so excited to be out meeting new people and building new friendships!” Everyone likes to be around positive energy. We all know how hard it is to keep up with friends who live in different states, have different schedules, lifestyles, etc, but the key is connecting with regularity. Even if it’s micro movements like calling each other at a set time each week or couple of weeks, or sending texts periodically, it’s keeping the contact consistent. Shasta revealed that this is key for friendships, because consistency helps build trust between friends. Helps instill the “safety” factor in the relationship. She pointed out very keenly that this process of meeting people regularly happened as children when we were in school, and happens daily in the workplace. There is a structure to the relationships, helping people bond more easily. Things like deployments, church groups, university settings, and volunteerism place people in routines with consistent patterns, and naturally lead into the development of friendships. This is the component of friendship that Shasta says “makes us feel seen”. Being vulnerable doesn’t necessarily mean we have to “vomit our vulnerability on new friends, rather, our level of vulnerability should increase incrementally with our consistency with that friend”. As we see them more often and the friendship grows, we are able to increase our capacity to be vulnerable with them. Vulnerability, according to Shasta, isn’t just sharing the hurting parts of our life, but can be translated as “initiating”. When we ask someone to connect with us for a coffee, walk, or get together, we fear rejection and the very act of asking is being vulnerable. It’s ok. And it’s ok if we get a “no”. That doesn’t mean we should feel rejected. At the conclusion of the session, Shasta challenged us to consider our friendships. On a scale of 1-10, how supported do we feel in our friendships? Are we putting too many expectations on the relationship and pushing that person away from us rather than drawing near? What is missing in our friendships, and how can we improve ourselves to be better friends to someone else? If positivity, consistency, and vulnerability are the three key ingredients to developing healthy friendships, what could I increase to improve the quality of my friendships? My favorite takeaway was undoubtedly the following remark I believe hit home for every person in the audience. Show up in beauty and light. It’s not about finding the right person to be your friend, but fostering the right relationships you have. Thank you Shasta Nelson for sharing your passion for friendships and connection with us today in the room. Your heart emanates light and love. I know I am not the only one who felt a connection with you. To learn more about Shasta Nelson’s work, check out her published books on the subjects of friendship and connection. What one word comes to your mind when you think of friendship?